This is our blog and all our woolly thoughts and stuff. There's a lot of wool. And cake. I’m not apologising for the lost time between posts because, well, I always apologise and it’s beginning to sound a little hollow. Just rest assured that from now on if you don’t hear from me it’s because I haven’t had anything interesting to impart, unless you care about how much theatrical scenery weighs and which is the best chandler to get a podger from. Yeah, thought not. Nothing interesting to impart... until now. Let’s start with a bit of backstory; aside from the usual heat-related summer slump (damn you 20+ degree weather) and the fact that work has been mind-bogglingly busy, my knitting output has suffered somewhat at the hands of my reignited love for geekery. My bedside table is groaning under the weight of pop-physics and -maths books while I voraciously consume theorem after theorem, and I’ve gone from annoying passengers on the bus with my little sticks to annoying even more commuters on the train who can’t understand why anyone would still be reading a cumbersome and papery book as opposed to a nice neat Kindle. I’ll explain in more detail my search for connections between maths and the fibre arts (a less cumbersome and papery way to describe knitting, crochet, sewing, quilting and cross-stitch/embroidery) in a future post, which I’ve been mentally writing for the last 6 months, but for the meantime let’s jump to Sunday 26th June 2011 and a really good reason to miss the last bit of sunshine we’ll get this year. 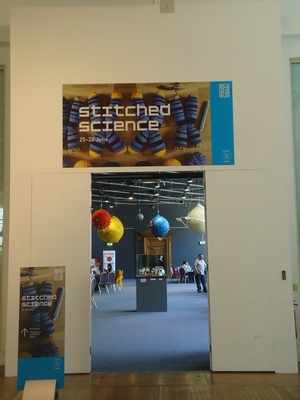 Having not properly read the Stitch London email advertising their collaboration with the Science Museum (“Stitched Science? Sounds right up my street; must file away to read later...” *never opens again*) I found myself sitting in bed on Saturday scanning social sites while waiting for my nail polish to dry, when I came across some photos of knitted Prof Brian Cox dolls and Saturn’s rings in I-cord. That sounds like somewhere I should be, I thought. That sounds amazeballs. So fast forward 24 hours and I dragged my hungover little tail feathers to South Ken armed with my trusty bag of sticks and the only camera that can cope with my shaky hands. And then you get like well excited. 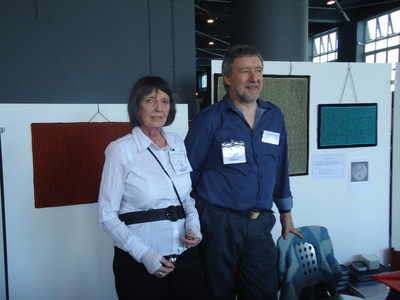 My first stop was with Pat Ashforth and Steve Plummer, otherwise known as Woolly Thoughts, or mathemaknitticians. Both are retired maths teachers who used crochet and knitting to demonstrate geometry to their pupils, although ‘retired’ is not exactly accurate as they continue to do this today, albeit off-curriculum. I hope they won’t mind me saying this, but their workshops have both taken the WI and schools by storm and directly helped to solve a drug culture problem in an unnamed community – impressed me, anyway! 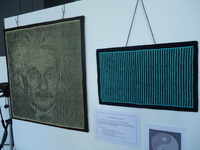 They had two workshops advertised – the first knitting geometric shapes and planning the patterns with a helping hand from Pythagoras, the second being the esoterically titled Illusion Knitting. And the fact that these had been advertised as starting at 11am is the only reason I was even awake at 11am. Geometric knitting is, put simply, a brilliant way to knit up funky shapes without necessarily needing to follow a stitch graph the size of an OS map. 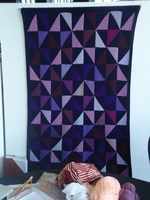 Any shapes that have 45 degree angles can be fitted together with relative ease, and knowing just one little Pythagorean axiom means you’ll always be able to work out how many stitches you need to pick up. So, the number of stitches we pick up from the side is (for the sake of argument) 14.
x is not a multiply sign; it is the way we describe an unknown number, in this case the length in stitches of the other two sides, and the big 2 is us multiplying their value. 2x² simply means “the length of the other two sides squared, times 2”. Easy peasy. Ok, so maybe this is only interesting if you’re a pattern writer or, like me, someone who doesn’t write down any designs and has to rely on mathematics to quickly calculate where you are in a project, but it’s still bloody brilliant to think there really may have been a point to algebra after all. And these are two beautiful examples of what you can do with it. Incidentally, now seems like a good time to impart my own piece of mathemaknitting wisdom. I never write my patterns down as I go when I’m creating something new because I find it stems my flow. Instead, I stick to a rule of three, mostly because I like the number three. If I have to increase or decrease at regular intervals, or have to get to a certain number of stitches, I make sure all these values are multiples of three. That way if you forget how many you decreased by, you’ll know just by looking if it’s 3, 6 or 9, all of which look quite different from one another when knitted up. You can do this with 4 instead if you need to keep to even numbers (pah), although I wouldn’t recommend anything larger than 5 or 6. 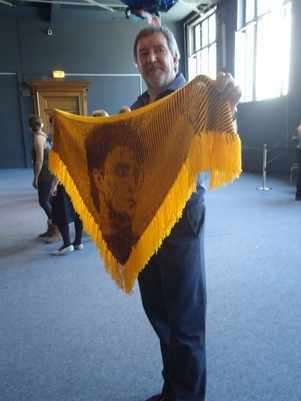 And I think Steve would be very upset with me if I didn’t show you his practically photographic rendering of Harry Potter on a shawl in Gryffindor colours, although I rather daftly didn’t take a photo of it from the front. 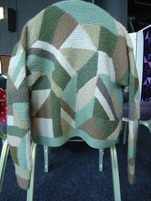 Still though, it’s a masterful example of hiding patterns inside patterns – actually, it’s a masterful example of knitwork full stop. It’s worth mentioning that this is a kind of knitting that you really can’t do without a pattern, certainly not if you’re doing something as intricate as a portrait. You can find some of Pat and Steve’s free illusion patterns here and I strongly recommend you give it a go, because it’s easier than it looks and produces astounding results. 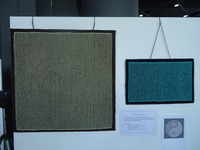 I finally dragged myself away to see some of the other exhibitions and take a shufti at some of the textile creations on display. 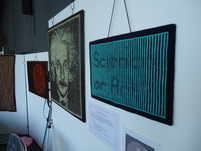 I saw Prof Brian Cox *swoon*, Patrick Moore, Marie Curie and Galileo, not to mention a huge display of ‘stitched selves’ sent in by stitchers from far and wide. That’s not all. 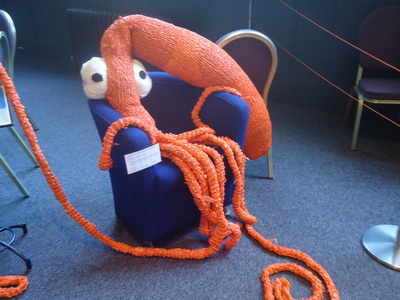 There’s a giant electrical plug and wall socket, a bacteriophage, a couple of skulls, molecules, DNA and a modest wee nebula to name but a few, but you’ll have to go to our Facebook page to see those (and much more), otherwise my blog will crash... Oh, and a giant squid. Did I mention the giant squid? This dear little guy is knitted up from ‘plarn’, otherwise known as plastic bag yarn. A wonderfully crafty way to use up those few hundred shopping bags you end up with each week, the principle is to lay the bag flat, cut into inch wide horizontal strips so you end up with hoops of plastic, link them all together to create a ball of plarn and hey presto! Get your size 10s out for a plarn project though, and I would also recommend a liberal dose of talc between your fingers as it is much harder to keep tension with than yarn. 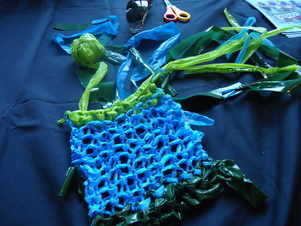 The ongoing project was a cumulative effort to knit a plastic planet earth out of hundreds of knitted plarn squares – apparently by the time I got there they had all the continents and only needed sea, but I like to think my contribution will end up at an outlying Pacific island or something. Maybe a really square one. I dunno, I was crap at geography. My next stop was the genuinely most science-y bit so far, run by a group of real life neuroscientists who are as handy with needles as with neurons. 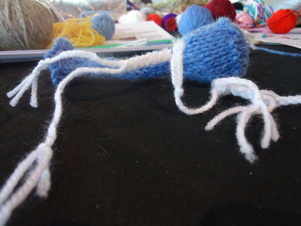 Anne Cooke’s Knit-A-Neuron project essentially gives you three ways to make a model of a neuron, all the while teaching you how your brain is telling you what to do to make the model neuron! Although it’s just for fun it’s very enlightening, and really goes to show how textile arts are a wonderful way to create a 3D model based explanation for pretty much anything. 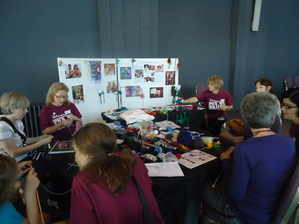 You can learn too at http://knitaneuron.blogspot.com – there are instructions for crochet, 2-needle knitting and knitting in the round versions of the same neuron, and you can go crazy with the number of dendrites you want to add. 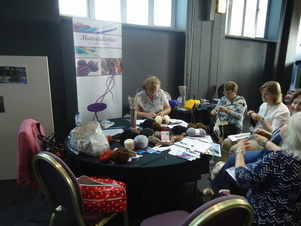 The Materialistics may sound like a 60s girl band but they are in fact a very talented knitting group from oop North with a penchant for large scale knitting, including a coat for a boat and a knitted Victorian Christmas! 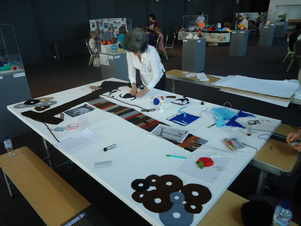 Today they were stitching the components of a knitted collage depicting the steam energy exhibition on the floor below. 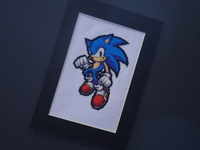 The parts were made up of knitted, crocheted and cut felt shapes, all made from templates alone in order that each component could be picked up and knitted by a succession of crafters of all abilities, which is a surprisingly useful way to do 2D knits. If you ever get to see the finished article there’s a little cream bell shape which has 12 rows of my own handiwork within it. Achievement face. My final stop, and my first attempt at a whole new craft, was Mr X Stitch’s embroidery stand where the science made way for sci-fi and the knitting needles made way for a good old fashioned thread needle. 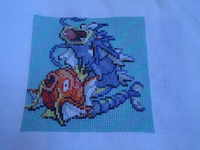 Having not touched cross stitch since primary school, where I made a bookmark that frayed at the edges and bowed the spine of the book, I picked up a hoop and a template and was surprised to see how similar it is to intarsia, except that you can do the stitches in pretty much any order within reason. 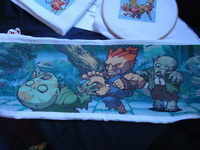 Jamie Chalmers (Mr X Stitch himself) and his merry band of stitchers showed us how easy it is to create a piece of needlework art simply by remembering to always cross your stitches the same way; even better, they proved that needlework is not only easy but very up to date as a craft, and lends itself well to graphic art and pop culture – certainly no twee flowers and middle aged aphorisms here. Maybe it was because their examples were all videogame characters and graffiti, but I was strongly reminded of Tim from Spaced and bombarded with mental images of Simon Pegg doing cross-stitch, and that just made me love it all the more. I’m not even going to pretend I’m surreptitiously slipping a link into the copy here; I insist you visit this linky when you’re done reading and have a go for yourself. It’s like Banksy meeting your nan and them getting on like a house on fire. That’s a good thing. By this time it was 15 minutes after closing and rather than be manhandled by the security staff I decided to call it a day. I can’t tell you how excited I was by the prospect of finally getting my loves of knitting and geekery in the same room, and if I ever needed inspiration to further pursue them both I know where to go to get it. I also recommend, for those of you who read the stitch bits and skimmed over the equations, that you sign up to the Stitch London mailing list, even if you aren’t London based – most of the contributors today were visitors to the capital and you don’t need to live here to read their emails anyway. Of course, if you do live in London – particularly the South West – then get your sweet cheeks over to the Balham Bowls Club from 7- 7.30pm every Wednesday where you can find the Stitch Balham crew swapping tips and supping pints on a regular basis. Pluggity plug. I’m off now my knitty friends, doubtlessly to abandon you for another month while my theatrical alter-ego earns some dough, but I’m always checking in to FB and Twitter so if you have any questions about what you’ve read here please don’t hesitate to get in touch.